Get an experienced attorney on your side. Make sure your final wishes are adhered to. Ensure that your loved ones receive the inheritance they deserve and that your values are protected. GET THE LEGAL ASSISTANCE THAT ESTATE PLANNING REQUIRES. Mr. Schottler is dedicated to helping you make the right decisions when creating a will or trust to ensure your values are protected and your loved ones are taken care of. That is why I have put together a free guide giving you the 12 Things to Consider Before Creating a Will or Trust. Let my experience help you in gathering the facts before making any decisions. For some, the topic of estate planning can seem grim; perhaps that’s why 51% of Americans between the ages of 55 and 64 don’t have an estate plan. The truth is, everyone has an estate, and that means everyone ought to have a regularly updated estate plan. While this is most important for anyone getting ready to retire, it’s still important to people of all ages because one never knows when they will become incapacitated by illness or injury, and certainly no one knows when they will die. Many people underestimate just how many areas are handled by this sort of planning, from guardians for dependents and funeral plans to the transfer of business, and as a result, those choices are left up to probate court. Believe it or not, 40% of Americans over the age of 45 don’t have a will, and the reasons most often cited are: feeling they didn’t need one (17%), feeling it’s not an urgent task (22%), and never finding the time to make one (57%). Yet incapacitation and death are unpredictable. Having a living will and last will and testament in place not only remove ambiguity and avoid unnecessary complications, but it will avoid laying an undue burden on your loved ones while ensuring that the right people are in control of or receive the correct parts of your assets. Estate planning is an important step in protecting your family should you be incapacitated or die, and a key option for that plan may be a trust. 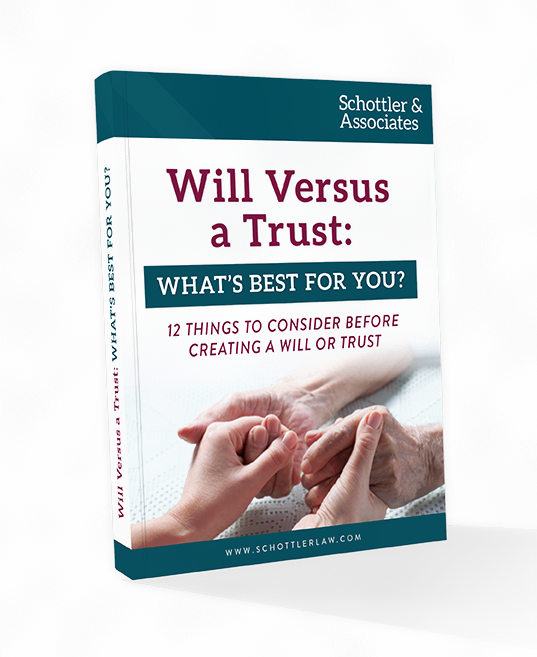 Unlike a will, your trust actively survives your death, guided by the successor trustee so that all trust property is delivered as laid out. Most importantly, property held in living trust avoids the probate process. Like all trusts, a land trust is an agreement by which the managing beneficiary directs the trustee in how to handle the benefits of that trust (in this case, real estate). While the managing beneficiary remains the liable party in land trusts, the deed which conveys the property to the trust doesn’t identify any of the parties involved; only the beneficial interest is assigned. We’ll help you negotiate and manage a land trust. "I've known Mark Schottler for several years now, any problems I have, Mark is always there with the remedy. His knowledge is precise, and on point. Any co-workers, associates, or family members that need assistance, Mark is the first person I call." "Everyone in the office is professional and polite and responds to every question. I would recommend them to anyone!"